Nikola Broadband – a division of NIkola Engineering Inc. Since 2003 Nikola Broadband has provided high speed internet services to the rural residences and downtown businesses surrounding Sequim. Residential internet connection data plans can service low bandwidth needs of someone that just needs to get email and check social media, to equipment capable of streaming high quality video and games. We can provide fiber optic internet to select locations in the downtown area of Sequim, Washington. But we primarily offer wireless internet. We are a Sequim company, with roots in the community and local economy. We don’t engage in selling or buying subscriber data for marketing gimmicks, and we won’t blanket your address with endless flyers for limited time promotional rate teasers. Going to be gone for longer than a month? Give us a call and we will suspend billing while you are out of the region. Of course, you still have full access to your e-mail while traveling. All for no additional cost. 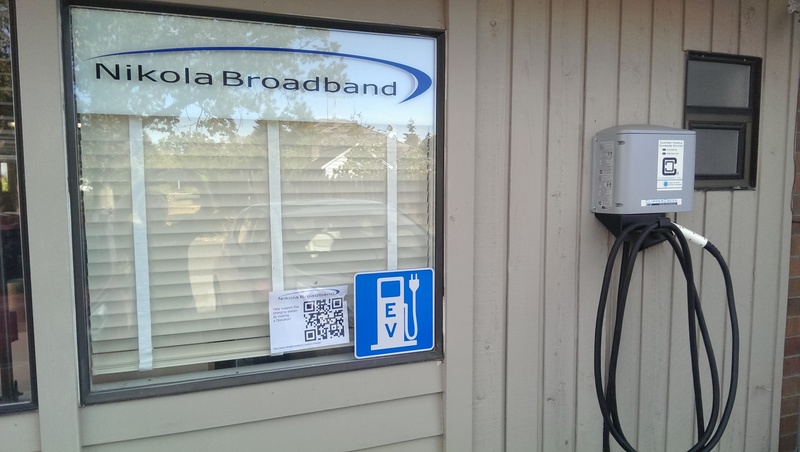 Nikola Broadband has installed a Clipper Creek Level 2 Charge Station, one of the few high output charge stations on the Olympic Peninsula. This is a 11.5kW, 48A J1772 Charge Station for EVs, and is located on the alley side of our building. The charging station is monitored by both Ubiquiti and Mobotix security cameras. Did you know that Nikola Broadband is an authorized retailer of these cameras? Come in and see how they can be used to secure your business or home. If you find the EV Charger useful, please help us offset the cost of its installation and electricity by making a donation. You can also find a map to local eateries [HERE].